An earthquake struck Aceh Indonesia again yesterday (2 July) with a magnitude of 6.1 and it has caused 22 deaths so far. 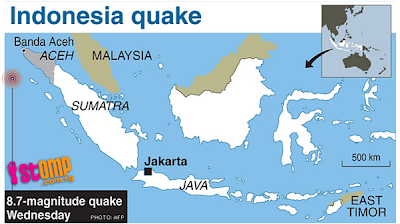 Read more about it @ http://www.channelnewsasia.com/news/asiapacific/22-dead-in-indonesia/732198.html It was mentioned in the article that "Indonesia sits on the Pacific "Ring of Fire" where continental plates collide, causing frequent seismic and volcanic activity." Can you explain how the movement of the plates cause earthquake and vulcanicity? 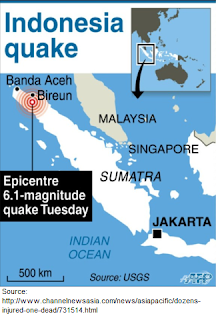 Compared this with the one that struck Aceh last year 11 April 2012. The magnitude was higher at 8.7 but less casualty was reported. Look at the epicentre of the quake. Explain what is a epicentre and show how it can determine the amount of damage to a place. 0 Response to "Earthquake in Aceh, Indonesia 2 July 2013"